When Thoreau wrote that “[e]ach town should have a park, or rather a primitive forest…where a stick should never be cut for fuel, a common possession for ever, for instruction and recreation,” (Journal, 15 October 1859) he planted the seed of the modern conservation movement. John Muir and later generations have worked throughout the US and across the world to protect land for the common possession. Walden Woods was Thoreau’s inspiration, and the Walden Woods Project was founded to preserve Walden Woods as Thoreau imagined it. We believe that it can serve as an inspiration to people the world over to develop their own conservation ethic and discover their own personal Walden. 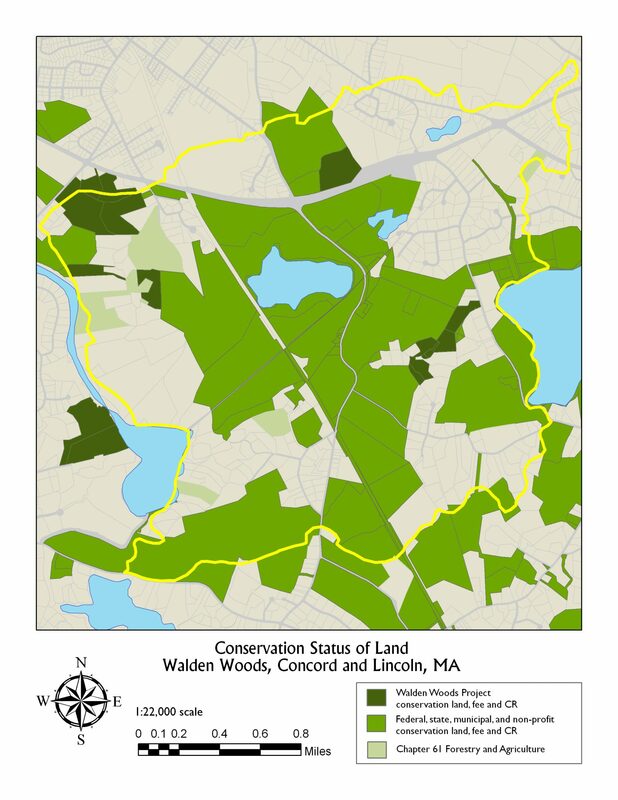 Since 1990, when Don Henley founded the Walden Woods Project, we have protected over 170 acres of highly-threatened land on 14 sites within Walden Woods. Our properties are highlighted in dark green on this map. Our properties include the campus of the Thoreau Institute at Walden Woods, Brister’s Hill, Bear Garden Hill, and the Farm at Walden Woods, among others. Walden Woods benefits from a long tradition of land conservation, going back to the protection of land around Walden Pond in the 1920’s. 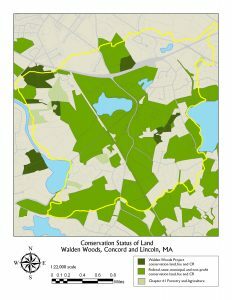 With our conservation partners, including the Massachusetts Department of Conservation and Recreation, Towns of Lincoln and Concord, the Lincoln Land Conservation Trust and Concord Land Conservation Trust, nearly 80% of the land within Walden Woods is in permanent conservation protection (areas in green on the map). Challenges remain; land in Walden Woods is extremely valuable and development remains a threat for unprotected land. The Town of Concord’s 35-acre municipal landfill, immediately adjacent to the Walden Pond State Reservation could potentially be developed in the future as technologies advance. The Walden Woods Project will continue to seek opportunities to protect more of Walden Woods so that it can remain a beacon of inspiration to the conservation movement.